A lot of the talk in education reform focuses on teacher quality as the key factor to influence in order to impact student achievement. While teacher quality is important, and other school-based factors also play a role, it is also important to realize that 50% of the factors that determine whether or not a child is successful in school come from OUTSIDE of school. Family, neighborhood, trauma, health, etc. All of those play a role in student success. So, yes, schools and school systems should focus on factors they can control. I’ve even written about my own ideas on this topic. But, it also makes sense for schools to build partnerships with organizations and programs that can have a positive impact on the outside of school factors in student achievement. To that end, I gladly accepted an invitation recently to tour Kirkpatrick Enhanced Option School and hear more about a fairly new (to Nashville) organization called Communities in Schools. CIS operates in 3 elementary schools (Kirkpatrick, Warner, Ross) and just added a Site Coordinator at Bailey Middle School. Fortunately for Nashville, the national CIS organization has been around for 35 years and has lots of data on what works (and what doesn’t). As its name suggests, Communities in Schools seeks to build a community around students in some of the most challenging (economically) schools in the district. Because they know that outside factors influence kids, they are set up to address those factors. The Site Coordinators are typically trained Social Workers who understand the importance of connecting students and their families with services available. For example, at Ross Elementary at the end of the 2012-13 school year, there were 12 students who had received vision screenings and needed glasses but still didn’t have them. CIS staff worked with a local eye clinic to arrange appointments and help those students get the eyewear they needed. No amount of focus on teacher quality will help if the kids in your class can’t see because they need glasses they don’t have. CIS is a data-driven organization that sets goals for the students in the schools it serves and then achieves those goals. Yes, they met 25 of 27 performance objectives they set in 2012-13. Items like improving academics and attendance for the students they served. CIS works in partnership with the schools to set up support services for students and for families. One of the areas where they focus attention is on parent involvement in schools – and at the three sites where they have been working, parental involvement has increased significantly. Another area of focus is attendance. If a student isn’t at school, they simply aren’t going to learn. And they are going to fall behind. By introducing strategies to promote attendance, CIS has been able to impact and improve attendance (and mitigate chronic absenteeism) at the schools it serves. I walked away from an hour at Kirkpatrick impressed with the dedication and commitment of CIS staff to the success of the students at the schools they serve. The ability to connect families to resources and to help children meet their specific needs lifts a burden from teachers and school staff and strengthens the school community. It truly takes a community to make a school work. CIS-TN is making that happen in a small corner of Nashville. It’s a success story that deserves to be continued and expanded. We are committed to doing whats right for kids and we’re going to continue to be committed to doing whats right for kids. It’s important we talk to people, it’s important we listen to people, it’s important that people have input. The Times-Free Press story also includes a poll asking if readers support Huffman’s ouster. Apparently, Huffman believes continuing to attack teachers and dis-incentivize entry into the profession is good for kids. Or, maybe he knows better than almost half of the state’s Directors of Schools how to help kids achieve? Or, perhaps his collaborative style is so incredible these Directors have been consulted by him and they don’t even realize it? Amelia Morrison Hipps is advocating the idea of giving School Boards taxing authority. It’s a good idea and one which can certainly be handled in such a way as to build in accountability. For example, setting a maximum amount taxes can be raised before a public referendum is required. Letting School Boards set policy and establish budgets WITHOUT also giving them the ability and responsibility to raise revenue creates tension between two governing bodies that should be working together to better communities. It’s an idea that’s been discussed and debated before — but also one meriting more attention. Huffman on the Hot Seat? Is Education Commissioner Kevin Huffman finally feeling the heat? A group of 60 Directors of Schools from around the state signed a letter calling for a halt to the fast pace of education reform — reform that some critics suggest has little to do with helping students. Some recent proposals for changing public education have included changes to teacher licensure (that could result in more testing of students) and an unproven teacher merit pay plan that could place an unfunded mandate on local governments. In addition to the concerns of the Directors, at least one state legislator is complaining about the most recent proposal. Having a letter signed by 60 Directors suggesting that the pace of reform slow and that the actual reforms be re-evaluated seems unprecedented in the state. Now, the question is: How will Governor Haslam and the Commissioner respond? Quite simply, because it pays off. Workers get better wages, the economy thrives, businesses locate here. Yes, all that makes sense and we hear it all the time. 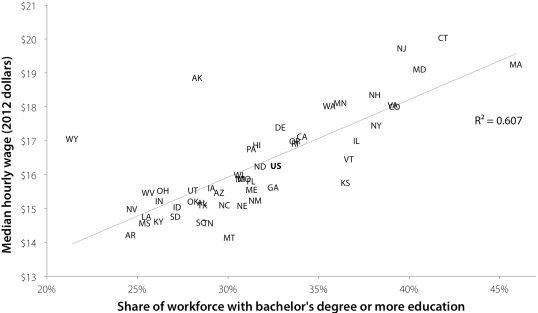 Now, there’s some pretty clear evidence that having a well-educated workforce is more important than low taxes when it comes to improving a state’s economic outlook. In fact, according to the Economic Policy Institute, there is NO correlation between a state’s tax rate and it’s relative prosperity. 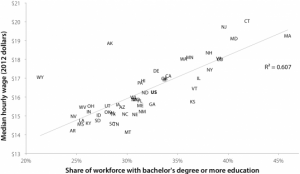 On the other hand, look at this graph and note where TN stands — on the low end in terms of both number of residents with a college degree and median wages. So, while offering all kinds of tax breaks seems to be the trend when it comes to Tennessee cities and the state government luring business to our state, we’d be better off in the long term to ramp up or investment in and support of public education. Perhaps along the lines of this proposal. State Senator Rusty Crowe of Johnson City recently penned a column directly addressing his disappointment in the State Board of Education’s decision to link teacher licensing to student test scores. Crowe suggests that using value-added data to inform teaching practice and even as a portion of a teacher’s evaluation is appropriate. But using it to take away a teacher’s license is not acceptable. Crowe concludes his piece by noting that he expects some level of legislative intervention in the matter. Hardly an idle threat given that Crowe is a long-time member of the Senate Education Committee — the very committee that oversees State Board of Education action. A simple, straightforward legislative intervention might be worded in such a way as to prohibit the Tennessee State Board of Education from enacting any policy that would cause a teacher to lose his/her license on the basis of student test scores. Of course, it may have to repeal any such policy previously enacted, but since the testing proposal doesn’t take effect until 2015, it may be sufficient to prevent its implementation. While teachers have been under attack by state policymakers for several years now, it seems in this case, the State Board may have gone a step too far. At the very least, there’s sure to be legislative discussion around this issue in 2014. Bruce Baker has taken notice of all the exciting education reforms happening right here in Tennessee. He thinks they are so great, he’s calling them a smokescreen. …what do we know about the great state of Tennessee? Tennessee is persistently among the lowest spending states in the country on its public education system. Tennessee is not only one of the lowest spenders, but Tennessee spends less as a share of gross state product than most other states. Tennessee has one of the largest income gaps between public school enrolled and private school enrolled children, and has among the higher shares of private school enrolled children. Tennessee has relatively non-competitive teacher wages with respect to non-teacher wages. In short, Tennessee is simply NOT investing in schools. And historically, the state hasn’t invested in schools. As others have noted, all the education reform in the world won’t do anything without significant investment. Baker concludes with this brilliant statement (admonition)? My point here is that we all need to start looking at the BIG PICTURE regarding these state systems of schooling – the context into which new policies, new strategies, “reforms” if you will, are to be introduced. As I’ve noted previously, even if some of these reform strategies might be reasonable ideas warranting experimentation, whether charter expansion or teacher compensation and licensure reform, none can succeed in a system so substantially lacking in resources, and none can improve the equity of children’s outcomes unless there exists greater equity in availability of resources. Perhaps it is no coincidence, then, that Bluff City Education noted yesterday that Tennessee’s high school graduation rate dropped by 2.2% and that since 2010 (when Tennessee “won” Race to the Top) the state’s ACT scores have remained relatively stagnant. What Tennessee needs is not more reform for the sake of reform. Tennessee needs a sustained commitment to investment in its schools. Today, as this piece is being published, the Tennessee State Board of Education will vote on changes to teacher licensure standards in Tennessee. Here are all the details of the proposal. Some elements are very good — a streamlined renewal process, a higher standard for entry based on content knowledge as demonstrated on the Praxis. And then, there’s the part about tying teacher licensure to performance on evaluations and value-added assessment scores. At first glance, it may sound great to expedite the dismissal of “bad” teachers. But, that’s not exactly what this policy does. Here’s the deal: A teacher MUST have a score of 2 on both the overall performance evaluation AND their value-added score in two of the three years before their license is up for renewal. But wait, you may be saying, not every teacher HAS value-added data available. Yes. That’s true. And that’s precisely the problem. Both Professional Educators of Tennessee and the Tennessee Education Association have expressed concern about the use of TVAAS data in licensure decisions. And of course, not only does every teacher not have value-added data, there are also concerns about using TVAAS at all for employment decisions. The point, though, is that teachers will be treated differently based on whether or not they have value-added scores. Here’s a scenario. Math Teacher has overall performance evaluation scores of a 3 in all three of the years before his license is up for renewal. However, his value-added scores are a 1-2-1. So, he’s license is not renewed, he goes under review and could potentially lose his license. Band Teacher has performance evaluation scores of 2-2-1 in the three years leading up to renewal. Band Teacher has no value-added data. Band teacher is automatically renewed under the streamlined licensure scheme. So, Math Teacher, whose overall scores were higher than Band Teacher’s, is in danger of dismissal. Band Teacher is renewed. Math Teacher (and other teachers similarly situated) complain and/or sue. Solution? Just add MORE tests so that every single teacher has value-added data. This at a time when school systems like MNPS are studying the amount and cost of testing and it’s overall usefulness. And that’s the second problem with this scheme. John wrote yesterday about the need for a meaningful, focused program of teacher induction. Until that’s in place, it is difficult to say that teachers have been properly prepared. The lack of ongoing support and meaningful professional development is also critical. If teachers are going to be “under review” then support and assistance must be provided to help them get back on track. I’ve written before about the need for better pay and more support for all teachers, including an early career mentoring program. Changing the standards for licensure and renewal of licenses should not happen until these measures are put in place. Even then, there is serious and legitimate concern about the reliability and validity of TVAAS as an instrument for making employment decisions. And certainly, parents are concerned about their children’s performance on a week of testing (or more) determining whether or not certain teachers keep their jobs. The issue of teacher quality is certainly an important one. The State Board of Education and Department of Education should focus on addressing it with meaningful investment in and support of teachers, not a mandate for more and more testing of students. Andrea Zelinski had this story last week on MNPS Board Member Jill Speering and a possible resolution challenging the current climate of testing. Instead of the resolution passing, MNPS Director of Schools recommended a study session where many of the questions raised by the resolution can be addressed. Speering and fellow Board Member Amy Frogge (a frequent critic of the current testing emphasis) agreed and the Board will now examine in study session the number of hours students spend taking tests, test prep hours, cost of tests, etc. “We at the state level feel like we need to measure results and we need to know how we’re doing. There’s no way to know what areas you need to improve in if you aren’t measuring something,” Huffman told reporters last month. This is of note because it implies that without testing at every level and in every subject, it is impossible to tell if teachers are doing well or if schools are meeting the mark. “I think we can’t live in a world where we pretend that everybody is doing OK, so it’s necessary to measure and see whether we’re making progress, what are the things we do well, what are the things we have to do better. If you don’t measure, you don’t really have a sense of how you’re doing,” he said. Huffman failed to indicate how he knows that Harpeth Hall, where one of his own children attended school, is doing OK. There’s no state mandated standardized testing there, no TVAAS scheme. How, exactly, did Huffman know his child’s teachers were doing ok? Because he paid money for it? Because other people say it’s good? Or is it that good teaching and learning is about more than numbers on a spreadsheet. Could it be that the music teacher gets a kid so excited about school that they soar in all their other subjects? Could the history teacher who is not the strongest in content be the one who serves as a mentor to children with no other adult role models? Could it be that Huffman can observe (just as other parents do) that his child is excited about school, is improving from the first day to the last? What about the kid who works hard and gets a C in Algebra just so he can keep playing football? How do you measure that? Was it the Algebra teacher’s inspiring lessons or the coach’s mandate to get good grades that “added value” to that kid’s education? Is it worth the time and expense it takes to test in every single grade across multiple subjects — taking time away from instruction and growth? Would a simpler, streamlined set of tests be both more cost effective AND better for kids? As MNPS studies the issue further, parents and the community will at least gain a better understanding of how often and for what purposes their kids are tested. And we’ll know more about the costs. Perhaps the next step will be to move forward with an agenda that’s good for kids (and works at Harpeth Hall), even if all the policy-making adults in Nashville aren’t happy.